Do you love the sound of music that you can only get from LP records? How can you take your LP music on the go? Here’s the answer – check out the Crosley Nomad Portable Turntable, to play all your favorite LP music, wherever you go. It has a portable design like a vintage briefcase, and still includes a 3-speed turntable and built-in speakers. 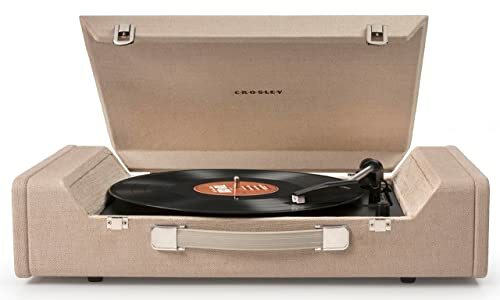 The Crosley Nomad has USB connectivity, so you can put all your favorite vinyl LP’s on digital files. Just plug in the included USB cable and watch the Nomad create digital files as your record plays. The software you’ll need is supplied with the turntable. Now you can take your vinyl anywhere you like! The Crosley 6232-A Nomad is driven by belts, and that means you’ll experience less vibration. The belt performs like a sophisticated shock absorber, which protects the platter from any resonance that comes from the motor. When you shop for self-contained turntables, look for bigger, not smaller. Larger units like this one give you more power. This isn’t the largest record player you can find, but it does have a quite decent size and lots of power to deliver the sound from your LP’s. The 10 & 1/2 pound unit means less vibration when you play records. As is the case with most portable turntables, your Crosley Nomad will play 33 & 1/3 and 45 RPM’s, as well as 78’s. It’s probably been a long time since you heard old 78’s, so give them a spin! The turntable comes with an adapter for 45’s, and you’ll remember how those work, too. They slide over the center post, allowing for the large hole in the center of 45’s. The Crosley Nomad has two three-inch stereo speakers built in. It’s important to choose a unit with good speaker position, if you want the best sound. In addition, bigger speakers mean better sound. Some units have speakers in the back, but that doesn’t give you direct sound. You get RCA jacks and a headphone jack in the Crosley Nomad, so you can connect it to your own external speakers, for sound that is even bigger and better. It has its own pre-amp built-in, so it’s a powerful plug and play machine, even without external speakers. The Crosley Nomad plays all speeds of LPs, from 33 1/3 to 45 to 78 RPM. Turntable has a sturdy belt-driven mechanism for carefree operation. NP5 diamond needle and magnetic cartridge by Audio Technica are among the best types you will find on any turntable. Headphone jack, auxiliary input and RCA output all included. Wood-style, vinyl wrapped cabinet with secure snap closure. Software included for editing and ripping content. Crosley Radio has been around since 1922! That year, they received a license for the radio station WLW, which was known as “The Nation’s Station”. They brought radio to everyone, and then did the same with affordable turntables. In 1989 they developed a full line of vintage-inspired, authentic turntables and other electronics. In 2003, Crosley introduced the Stack-o-Matic record changer, which has its roots in the original turntables that made it fun for everyone to listen to records. A couple years later, they developed their first CD player and recorder that also recorded vinyl LPs to digital files or CDs. Today, they continue the expansion of their product line, utilizing the latest technologies, including MP3, iPod docks and Bluetooth. The Crosley CR 6232A BR Nomad turntable boasts high quality at a low price, and they’re not kidding. Whether you are young and want to try a record player, or remember playing LPs when you WERE young, this is a cost-effective way to have a self-contained unit that’s so easy to use. You can also use it to bring your LP music into the age of digital music. I noticed right out of the box that this record player is quite aesthetically pleasing, especially for a low-priced turntable. The wood-style cabinet gives it a retro look. The diamond stylus and magnet cartridge were made by Audio Technica, a high quality name I know from my research. So I wasn’t surprised at how well the turntable functioned for me. A lot of lower quality turntables use ceramic parts, and the sound is definitely not the same. Many turntable manufacturers boast that their products are portable, but few of them carry the sound of LPs wherever you take them like this unit does. I actually took it to a couple estate sales with me, so I could try out vintage LPs before handing over my money. It’s a great record player, especially for its low price. I did my due diligence and compared the sound of other turntables before purchasing this one. One of the record players I checked out and compared is the Boytone BT-17DJM-C. I was looking for a record player because I wanted to relive the quality and tone that is absent from digital music. I grew up with records, and although I listen to digital music all the time now, I wanted the feel of the old vinyl LPs, and I got the no-skip and clarity of sound that I wanted from the Nomad. The Boytone turntable, in contrast, made my records sound lifeless. They just didn’t sound like the classic tunes I remembered. The sound was more like what I would expect from a boombox, rather than a vintage-inspired phonograph. One of the best and least expensive ways to take your LP music with you is with the Crosley Nomad. It’s not only affordable, but reliable and durable, as well. It’s an excellent choice for youngsters starting out with LPs and for people who want to dust off their old LPs and enjoy them again. Being able to use this turntable unit to convert your LPs to digital music makes it an even better deal.